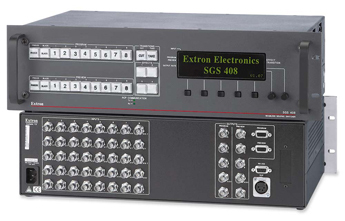 The Extron SGS 408 is an eight input, high resolution component video and RGB matrix switcher that provides seamless cuts, dissolves, wipes, and titles as well as scaling capabilities to bring professionalism and style to live multimedia events and presentations. The SGS 408 is designed for staging and rental applications where it performs seamless cuts and digital, presentation-quality transition effects during switches between multiple sources to a common projector. 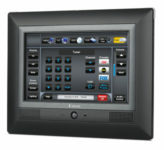 The SGS 408 incorporates two high performance video scalers as well as a digital video mixer and can handle component video and any type of RGB input from video sources up to high-resolution workstations. Twelve dissolve, wipe, and title effects are provided to further enhance the professional look of shows and presentations.